Who Wants to Get Buzzed? There’s a buzz over at Newport-born, globally adored Farmaesthetics! The company’s Midnight Honey Body Buzz is featured in the November issue of SHAPE magazine (love SHAPE!). Midnight Honey Body Buzz is a luscious at-home treatment by that utilizes whole grains, organic oils and pure honey to create a rich, round, softly-scented body experience. Honey is complex in its therapeutic benefits to soften skin while being wildly engaging to the senses. This herbal combination creates a body buff to remove dry, rough skin, while wrapping you in velvet, supple warmth, yielding a depth of relaxation rarely achieved in at-home treatments. Plus, it’s great for foot treatments, like an at-home pedicure. Best of all, Farmaesthetics products, made right here on Aquidneck Island, are 100% natural, contain certified organic ingredients as indicated, are hypo-allergenic, non-irritating and dermatological tested. They carry a certified shelf-life of 2 years from the date of opening. And much to my liking, they do not test on animals. To celebrate SHAPE’S coverage, we’ve partnered with Farmaesthetics for a Newport Stylephile reader to with a luscious Midnight Honey Body Buzz Gift Set. To enter, leave a comment below and LIKE the Farmaesthetics Facebook page (click here). Please leave a way to get in touch with you if you win, either an email or Twitter handle. Entries accepted through 11:59pm Friday, October 25. Good Luck! 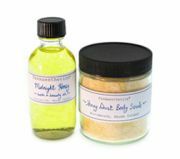 Directions for your at-home spa body treatment: Pre-mix cornmeal scrub mixture: mix 2 tablespoons Honey Dust Body Scrub with 1 tablespoon Midnight Honey Bath & Body Oil (measurements in approx. amounts). Apply in shower in circular motion for full body exfoliation (do not worry, cornmeal grains will not clog the drain…). Rinse thoroughly. Towel dry. Apply 1 tablespoon Midnight Honey Oil to body to wrap the skin in velvety warm moisture that will fully rehydrate & restore suppleness to the whole body complexion. Ingredients: Midnight Honey Bath & Beauty Oil: soy oil*, honey absolute, vitamin e (2 fl oz glass bottle with pump). Honey Dust Body Scrub: finely ground yellow cornmeal & honey powder (4 oz glass jar). Product available in Scrub Set only. Not sold individually. (*certified organic ingredient). Honey is unlike any other ingredient in nature and has yet to be synthesized in a chemistry lab. Richly round, darkly-scented Midnight Honey Bath & Beauty Oil is an inspired preparation—true, elegant and complex in its ability to deeply condition the skin while restoring suppleness and unleashing the senses. Use for massage or in the bath or shower. Apply after bathing when body is still damp to wrap the skin in rich, warm moisture, or use in combination with Honey Dust Body Scrub. Mix Honey Dust Body Scrub with Midnight Honey Bath & Beauty Oil for a therapeutic, richly emollient, full body exfoliation. Congratulations. Shape magazine is the best! I can’t wait to try Farmaesthetics. I need it to help soften my skin around my neck area. I’ve been wanting to try the Midnight Honey Body Buzz! I already use a lot of their other products, and am absolutely in love with everything I’ve tried so far! That’s awesome. I would love spa treatment at home! Treating myself is better than going somewhere… especially in the cold weather. My body needs to get a buzz! This looks heavenly! This is fantastic and something I could totally use !